When I was a little girl, combing outdoor magazines for inspiration, there was rarely a woman to be found—and if there was, she was always a top performing, elite athlete. While there are many women who can keep up with the boys and even lead the pack, I know I'm not alone in wanting to also see "sheroes" who are like me—pretty good at sports, but also smart, responsible community members who are generally well rounded. And, on top of that, I wanted to see women who give back to the outdoor community in which they play. Mt. Bachelor rentals manager Sung Choi poses at the bottom of Pine Martin with The Cone as a backdrop. What I couldn't articulate then, but increasingly notice now, is that women are thirsty to represent broader narratives: less adrenaline junkie, more girl-next-door adventuring. Less big air; more balance and sustainability. To satisfy the gap in editorial content that I've always wished for (a sentiment shared by the editor of this publication, too), we offer this too-short, yet carefully curated list of inspirational, everyday local pow-slaying sheroes. Whether hiking, mountain biking or skiing, Sung Choi does it all with a smile and wry sense of humor. She's dabbled in relay races, cross country skiing, motorcycles and "windsurfed and snowboarded in the mid-'80s." "I did Hood to Coast many times," Choi shares, "and when I finished, I felt a sense of accomplishment and so rewarded for all the training I put in. I love being outside breathing in fresh air—and it really beats cleaning house." Her current sports goal? Finding time to hike more, like two days a week instead of one. Choi captured the aspirations of many a Central Oregonian when she added, "I want to learn to golf this summer, go on bike rides, go kayaking more and work less." She adds, "I think we as a society need to be more active in general. We live in an outdoor mecca and we should take full advantage of it." 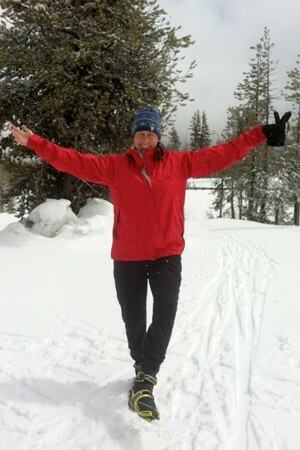 Julie Southwell celebrates the powder posing in skate ski boots. A talented concert violinist and a former nationally competitive cross-country ski racer, Julie Southwell is a renaissance woman who also enjoys hiking and gardening. Presently, Southwell educates and inspires Mt. Bachelor Nordic Center novices in cross country skate and classic skiing. Her current training goal is preparing for the skate leg of the locally famed Pole Pedal Paddle. "Nature is a spiritual connection place for me," reflects Southwell. "Although I also like to be with friends on the trails, I spend a lot of time alone for the meditation and calmness being in the beauty of nature brings." 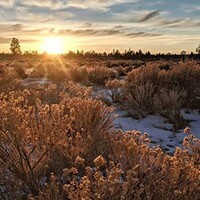 Southwell describes her most memorable outdoor adventure, saying, "Once I 'crust skied' around Broken Top (which took four hours) in the early morning spring, when the snow was transformed from the freeze-thaw cycles of night and day. One can "float" on top of the snow in this spring 'crust' condition, and the volcanic open landscapes of the Sisters/Broken Top area become like skiing on the moon! Perhaps that's why they call it "Moon Mountain" up there. This particular day... was both empowering and naturally mind altering, and a lifetime memory." Heather Barr cascades through powder at dawn. 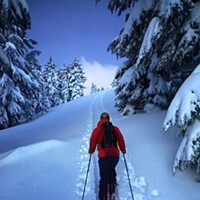 Though I had always admired Heather Barr as a fierce skier and mountain biker, recently I saw a status update her husband posted about a backcountry ski adventure and I was forced to fast track her to role-model status. 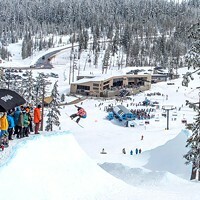 The post featured an image of Barr shredding down The Cone, with the caption, "Not saying everyone should tele at dawn while pregnant, but my wife does. Anatomy scan went well today, so it's Facebook official. What a great way to ring in the New Year!" Talk about squad goals. Presently six months pregnant, Barr is working on being OK not doing her usual ski adventures. "I'm taking my dog out cross-country skiing and staying in shape doing yoga, spin and Barre3 classes," says Barr. "This summer, finding the balance of being a new mom and staying active will be challenging, I'm sure, but I hope to be back on my mountain bike sooner rather than later."